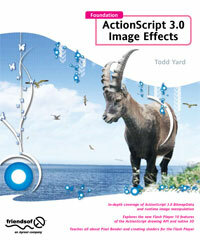 Brightcove Senior Software Architect and author of 13 books at Flash and ActionScript, Todd Yard, has just released a new paperback, Foundation ActionScript 3.0 Image Effects. Congratulations Todd on the new book and continued thought leadership in the Flash community. Flash has always been a tool for delivering compelling and unique experiences through dynamic visual presentation. The Flash platform has grown to include application development in Flex, video streaming with the Flash Media Server, and desktop delivery through AIR, but all of that content still comes down to pixels on the screen, and all of those pixels can be manipulated through the power of the ActionScript language. In this book, you will find in-depth coverage of the graphics capabilities of ActionScript 3.0: the enhanced drawing API in Flash Player 10 that allows you to draw vector shapes at runtime; bitmap filters and blend modes through which you can apply special, built-in effects to display objects; and the powerful BitmapData class that gives you control over all aspects of an image. In addition, you will learn about the new Pixel Bender technology and how you can use it to create custom filters and blend modes for your content through shaders. Finally, this book also breaks down the new native 3D support in Flash Player 10 and reveals how you can take advantage of this through ActionScript. You can visit Amazon to download sample chapters and purchase Foundation ActionScript 3.0 Image Effects and other books by Todd from friends of ED publishing, including Object-Oriented ActionScript 3.0 and ActionScript 3.0 for Flash CS3 & Flex.